The Universal Wolf story began more than 50 years ago when three steel workers from Newcastle won the pools and seized the opportunity to create a new business of their own. What started as a back street sheet metal business has now evolved into the leading complex sheet metal fabrication business we are today. 1964 – Back when football was good. In 1964 two ex Reyrolle employees, John and Austin, won the football pools and decided to form their own sheet metalworking company. Every day John and Austin had to walk underneath a bridge nicknamed the Tharsis Gate, at the bottom of Tharsis Road. After much puzzling over what to call their new company, they decided to name it after their trusty daily landmark. And so, just like that, Tharsis Welding & Sheet Metal Company was born. Things were going swimmingly until they received their marketing collateral back from the printers. There’d been a miscommunication over which vowel should be used at the end of the company name, and so, as a result of a printer’s typo, Tharsis became Tharsus. 1997 – 1998 – A fan-tash-tic development. By the late 90s things were getting pretty serious. There were no more mistakes made at the printers and business revenues were in the region of £1m. The business was bought from the founders by a young, handlebar-moustache-sporting Brian Palmer and his business partner Owen Sayer. Although Tharsus already managed to garner an impressive customer base, the company was run down and had been starved of the investment it needed to properly flourish. The offices were a swirling mound of paper and a million miles from the immaculate 5S dream we live and breathe today. The first CNC machine was installed and with it a new company name: Tharsus Engineering Limited. 2000 – New highs. And lows. We started to grow and with the technology boom as a catalyst, we began supplying prestigious brands like Marconi, Viasystems, BT and Ericsson. Great wads of cash were invested in more CNC machinery and office systems such as ERP. As if by some righteous act of hubris for the unprecedented growth of internet-based companies, the dotcom bubble burst in 2001 and brought everyone (including us) back down to earth with a great big thud. Many of our customers were hit hard by the tech crash and we, in turn, were impacted by the collapse. Our revenues fell below £1m and we made an operating loss. In 2003, Brian Palmer – now liberated of the 90s moustache – bought Owen’s shareholding and became the controlling shareholder of Tharsus Engineering Limited. His entrepreneurial spirit and unwavering resilience drove the business in the right direction and as a result we developed a new main distribution frame (MDF) product for telecoms giant BT. We’re proud to say that every telephone exchange in the UK has a Tharsus product in it. Tharsus Direct Limited was set up to design and supply cable management systems and products to support what was then called “the 21st Century Network” rollout. This project was to upgrade and increase capacity in the UK telephone exchange system. We ploughed heaps more cash into (literally) cutting-edge laser profiling and metal forming machinery. 2006 – The paint shop gets a makeover. Word had gotten out about how great a place Tharsus was to work, and we were bursting at the seams with bodies (peaking at 120 employees). So we spruced up the paint shop and the adjacent factory we’d leased from the council to make some room for the newbies. Our first foray into the world of advertising. We acquired Direct Message Limited (it’s getting a bit confusing isn’t it?) who had important contracts with the MOD. Our engineering experts took over the work, our main customer being BAE Land Systems. It was around this time that we developed a taste for full product assembly. Unaware of just how far it would take us, we embarked on developing a third arm of the business: Tharsus Vision. Aptly named, Vision initially specialised in the design, manufacture and supply of outdoor advertising products such as ad boxes. Some of our ad boxes can still be seen adorning the walls of the London Underground. 2008 – We get knocked down..
Tharsus was hit hard on several levels. The outdoor advertising market was beginning to crumble in the face of collapsing revenues, increased bank debts and the spiralling costs of new technologies. This, coupled with a drop in share prices, resulted in BT putting a stopper on their capital expenditure. But we get up again. Resilient little mites that we were, we managed to bounce back from the recession that blighted the nation. We sprung to life like a phoenix from the ashes, reinventing our Tharsus Vision business as an innovative developer and manufacturer of complex electro-mechanical products. You can read the next chapter in their story here. 2013 – We fly our Hebburn nest. In 2013 due to rejuvenation plans for the centre of Hebburn and a need for more space, we fly our Hebburn nest and settle in our new home at Spencer Road, Blyth. The new premises are colossal in comparison. We revel in the space. We also bag a significant contract in the defence industry after competing against global manufacturing companies. To stand out from the crowd we decide to rebrand to Universal Wolf. Universal Wolf is actually a very old term for ambition and we have a universally shared ambition to be the best in the industry. The term comes from the Shakespeare play Troilus & Cressida and describes appetite, power and will. We are defined by our universally shared ambition to be the best in our industry for our customers. Our service is unequalled. We are leaders of the pack not only in delivering exceptional products, but an exceptional customer experience. 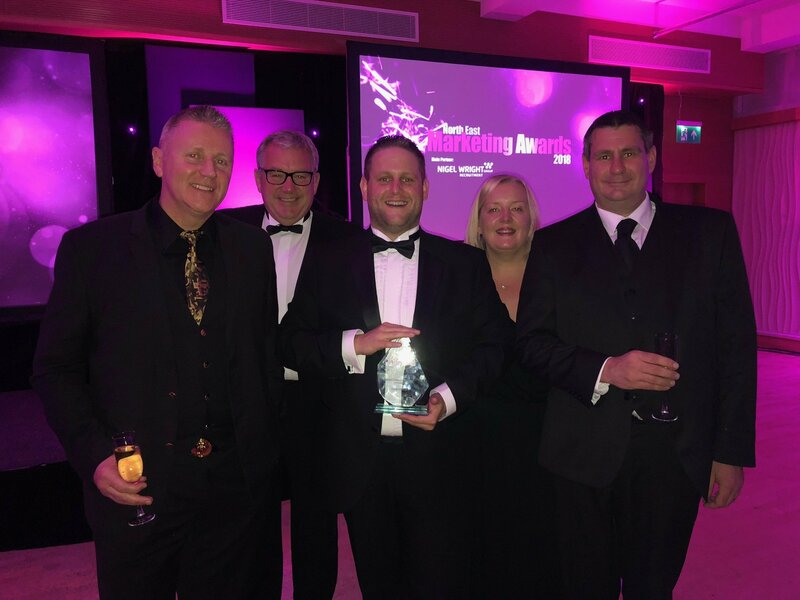 In 2018 we achieve record sales and also win an award for our new look: Best Brand Creation of the Year at the North East Marketing Awards. Our transformation continues with a factory improvement programme including £700k of investment in new equipment and establishing a dedicated NPI (New Production Introduction) department, providing a collaborative space for us to work with our customers to create new products and improve existing products. The scale of our NPI investment is recognised by our customers as a game changer in the metal fabrication market. For a competitive quote or to find out how we can work together, drop us a line.